Event supply companies that rent supplies and furnishing for all kinds of outdoor events. The bulk of the business from these companies usually comes from renting out tables, chairs, linens and other common items needed for an outdoor event or gathering. But portable outdoor heater rentals can also be a great way to increase your margins for each event. Most people probably won’t realize that they might need heaters for their events, parties, or weddings that are held at night and/or in the winter months. So it’s important to showcase your rental heaters on your website, or at some point during the sales process. Even a few degrees of unexpected chill could ruin an event, which is why offering outdoor heaters for rent is important. Just like other equipment you rent to different events, you’ll want to maintain your rental heaters in good condition. This is easy to do and will prolong the life of your heaters. Neglecting proper cleaning can cause dirt and other combustibles to block the airflow needed for the heater to work properly. At best, this causes the heater to burn more gas and produce less heat; at worst, this can make operating the heater a fire hazard. Outdoor patio heaters don’t require very much maintenance, especially if you use a heater built with high quality materials. The brands of heaters sold by AEI all adhere to strict product standards, so their heaters are durable and easy to maintain. Stainless steel won’t rust, but it can still get dirty or affected by corrosive elements and need to be cleaned. Use a solution made specifically for cleaning stainless steel, to wipe down any stainless steel surfaces. Never use corrosive or flammable cleaning solutions. Never attempt to clean your heater after use, unless it has cooled down completely(usually an hour or more). If your model of heater is painted with our visually appealing powder-coat; then you can simply wash the painted surfaces with a soapy solution, and wipe away immediately. The powder-coat is strong and protects the heater from the elements. So cleaning it is an easy and straightforward task. Removing soot from burning, pilot, and surrounding area: While these infrared heaters are very effective at burning their fuel, leaving only trace build up of soot inside the emitter panel. You should only use compressed air to remove the soot, and you should remove the emitter panel for maximum exposure. If you don’t have access to an air compressor, cans of computer dusters will work as well. You should never use water or any cleaning solution to clean the emitter grid. 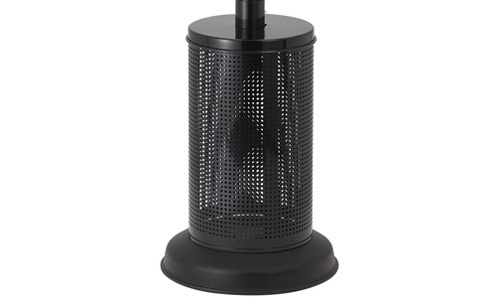 These outdoor heaters are such efficient burners, that soot builds up very slowly. So removing soot buildup is only needed once or twice a year. At minimum, it should be done before the start of each cold season. The importance of this safety precaution can’t be stressed enough, especially if you rent your heater out extensively. Regularly checking for gas leaks is the only surefire way to prevent injuries or health issues. Start with a visual inspection of your propane tank, gas line, and connectors; look for dents or cracks on the tank, and any tears or holes in the gas line. Gas tubes can become brittle over time and develop small micro tears that can potentially leak gas. The connectors between the gas tube and the propane tank should fit snugly. To finish checking for leaks, spray or coat the gas line with a detergent/water solution. Then, slowly, open the gas valve while observing the propane line. Soap bubbles will form if there is a leak present. The size of the bubbles is a good indication of how big you gas leak is. 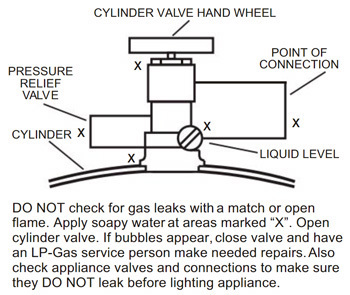 If there is a leak at the where line connects to your gas tank, you might be able to tighten the connection to stop the leak. If that doesn’t stop the leak, or the leak is present on the gas line; you should replace the fuel line and connectors. If you want to polish your heaters, you can do so with a small amount of car polish. The polish will look great, and protect superficial damages; such as corrosion from acid rain, and sun bleaching. Outdoor heaters made with superior materials are less susceptible to damage from the elements, but you may want to polish them anyway. Insects and spiders love to seek refuge or make their nests in the heaters after they have cooled enough for them to safely do so. This may not seem like a very big issue; but spiders, their webs, and other insects can actually make operating the heater dangerous. While bugs and spiderwebs aren’t necessarily flammable themselves, they can bring other combustibles into the heater with them(or various combustibles can get stuck to a web). The other potential issue is these intruders can cause full or partial clogs in the proper flow of propane, which can potentially cause a dangerous buildup of gas. It’s always better to check for, and remove insects and webs before renting out the heater. Using compressed air and some strong pipe cleaners are usually more than you would need to get rid of the pests.